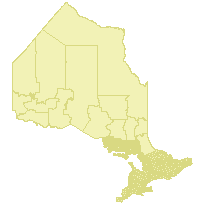 This data set can be used to identify the administrative boundaries of the aggregate inspectors in Ontario. Each aggregates inspector has a different area of responsibility. In the south, many inspectors use the geographic township boundaries to decide what their area is, usually based upon number of Licenses and Permits in the area and geographic size in which they have to cover. The areas are usually negotiated between neighboring inspectors, and their districts, and are subject to change periodically. In the North, generally the areas are the MNR districts. In addition there is now an associated table that tracks all the relevant information about each Aggregate Inspector, such as what District Office they work out of, their mailing address, phone and fax number. Supplementary look-up table descriptions are available in the SNIF document, which is available for download from the additional documentation section. There are really two purposes to collecting this data. The first is to easily allow the mapping of inspector areas, so that it is easy to find out who is responsible for a particular license or permit in a particular area. This may take the form of presentation type maps, or GIS queries. The second purpose is to allow the modification of the areas of responsibility easier, and to allow for analysis in that regard (number of licenses and/or permits in a particular area of responsibility). Horizontal: Moderate: +/- 1000 m; Vertical: Not Applicable.